Hands-On AutoCAD is a comprehensive, basic CAD textbook that teaches the AutoCAD software using short, interesting projects that will capture and hold student attention. 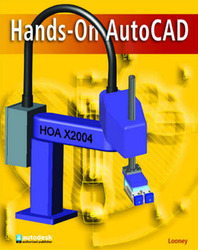 The chapters are ordered logically for CAD and cover 2D and 3D CAD. Each chapter has a separate "Teamwork Project" designed to allow students to pursue chapter topics in a second real-world scenario. National CAD standards have been developed by NACFAM. Hands-On AutoCAD is designed from the ground up to meet these National Standards. Comprehensive, basic CAD textbook teaches the use of AutoCAD software using short, interesting projects that will hold student's interest and attention. Covers both 2D and 3D drawings. Each chapter includes an interesting, real-world project in which students practice the skills taught in the chapter in context. Using CAD in context of real projects helps students understand how CAD applies to a variety of real career and job scenarios. Short, hands-on Try It! gives students practice with each new AutoCAD command or skill as it is taught in the chapter.